Counselor/Teacher Articles - Many suggestions for guidance counselors. E-Letters - Keep current with educational news with these! Fact Monster - Everything from Atlas, Almanacs, Dictionary, Encyclopedia, World News, Sports and other facts. Quizzes and games online. Memorization Help - Can you remember long lists? your students' names? Try this site for help! Motivating Moments - A wonderful site to peruse when you need a picker-upper. 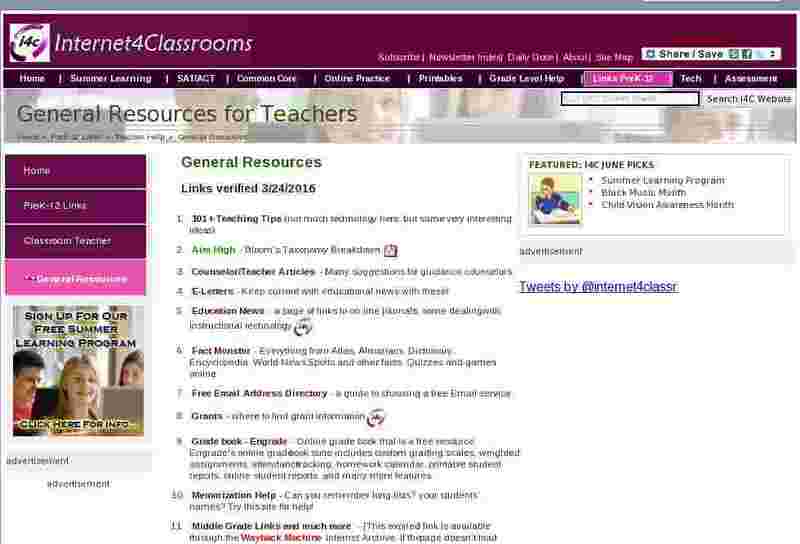 The New Teacher Page - links designed to assist new teachers. Professional Resources from Scholastic's Educator magazine - Find information on classroom management, assessment, grants and more. Simplevle - a virtual learning environment that provides a set of tools for creating online tests, quizzes, exams, and other class content including presentations, lesson plans, and homework assignments with a focus on simplicity.